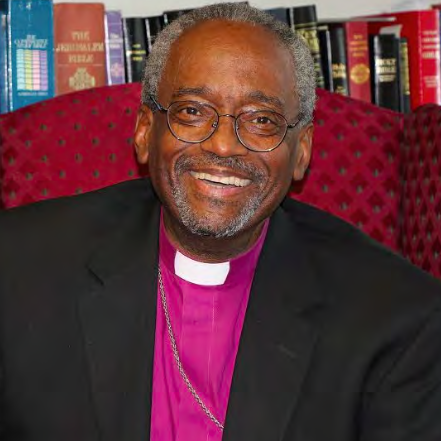 Incarnate and loving God, we give you thanks for Bishop Curry’s willingness to serve our church as chief pastor, proclaimer of the Gospel, and bold leader. Assure him of your grace in all things, envelope him with the holiness of your presence in all that he does, and prepare him for the difficulty of the task that lies ahead. May he keep your truth as the core identity of your church, and remember not to take himself too seriously. We offer all these things, with particular thanks for the example he has in your Son Jesus Christ, our Lord. Amen. As you take up the mantle of the 27th Presiding Bishop of the Episcopal Church, we give great thanks and offer you our prayers. As you begin to fulfill this call you have received from the Holy Spirit and her church, let us be so bold as to share our hope for the letter we can write you nine years from now. Thank you for your service. Thank you for your passion. Thank you for your prayers. Thank you for listening: to God, to the variety of people God has called to be a part of this church, and to all those who so desperately crave the good news of the Gospel of Jesus Christ. Thank you for casting a vision that challenged and inspired us. Thank you for being bold, even when you weren’t sure it would work. Thank you for standing with those who are oppressed, and challenging those who are the oppressors. Thank you for the model you have given your fellow leaders – for gently nurturing them to mature decisions and being present with them when apologies are to be made. Thank you for keeping the Anglican Communion together. Thank you for giving away more money than you have kept within the institution. Thank you for ensuring that youth and young adults are always and fully included in the proceedings and gatherings of this church from here on out. Thank you for setting term limits and age limits for deputies to General Convention, and infusing new life into the proceedings of the church. Thank you for ending debate about who is worthy of God’s blessing, and gratuitously, unapologetically blessing all of God’s people. Thank you for shaping your life around the prayers that have been gifted to us through the Anglican tradition. Thank you for prioritizing your relationship with Jesus, and encouraging us to leave behind the ways of the world and do the same. We are better for having known you. We are better for having been with you. We have caught a glimpse of the divine because of your call to build the Kingdom of God in our midst.